Jan Gardner’s campaign falsely accuses the Young Board of being fiscally irresponsible and for making out-of-control expenditures. However, at the same time, she urged the Young Board to fully fund the BOE’s request to increase its funding by $17 million. Many astute observers picked up on this inconsistency, but for those who have been taken in by this double talk, the following explanation can help you know the truth, and therefore know that Ms. Gardner’s characterization of the Young Board as fiscally irresponsible is false. The fact is that the Young Board has been more fiscally responsible than was the Gardner Board. Jan Gardner likes to compare her Board’s last approved budget (for FY 2011) of $438 million(i) with the last approved budget of the Young Board (for FY2015) $525 million. It is true that the Young Board’s budget is $87 million more than the last budget of the Gardner Board. If that was the end of the analysis, then Gardner would have a strong case that her Board was more fiscally responsible. But, an analysis of all the facts discredits Gardner’s conclusion; the superficial analysis that Gardner hopes will be sufficient to convince thee public cannot withstand simple, rational scrutiny. The FY2015 approved budget of the Young Board is more fiscally responsible than any of the Gardner Board budgets. Here are the facts. $ 5.6 million This is not an increase, but represents only an accounting change—putting the Permitting & Development Review funds into the county’s General Operating Fund. $5 million This is due to additional, increased funding to the BOE(vii). This is in addition to the $8 million for teachers’ pensions, covered in the previous item. During the four years of the Young Board the number of students has increased by 322. When this number is multiplied by the MOE rate, it results in increased funding to the BOE. $8.6 million This is due to increased funding for Fire & Rescue services (viii). Note that during the four years of the Gardner Board, when the population increased by 4,300 residents, the Gardner Board increased the funding for fire and rescue services by $19 million. While there was a population increase of 5,000 during the Young Board, the corresponding increase for fire and rescue services was only $8.6 million—less than half the rate added by the Gardner Board. $6 million This is for one-time budget transfers that do not require additional tax revenues(ix). The Young Board cut the size of the County employee force by 451 employees (or 19 %). (x) This has resulted in a savings to taxpayers of over $21 million/year. The Gardner Board increased the size of the County workforce by 222 employees through FY2010. It was not until her last budget, the FY2011 budget—two full years after the 2008 crash—that her Board cut the employee force by 145 people (still resulting in a net increase in the number of employees of +77). She was at least one year too slow in making this needed adjustment. During the Gardner Board, Fitch lowered the outlook on the County’s bond rating from “stable” to “negative” due to decreasing fund balances. The major changes made by the Young Board succeeded in restoring the County’s bond rating outlook with Fitch to the highest level (AAA stable) in 2012. The Young Board promptly made major expenditure cuts by reducing the size of the workforce. The Board then made a total of $4 million of additional contributions to the employees’ retirement funds to bolster those funds, so that they are now 90% funded—this is one of the best ratios in the State, and it is a significant improvement over the funding percentages during the Gardner Board. These actions, plus correcting the budgeting for fire and rescue services, have all improved the County’s fiscal position. 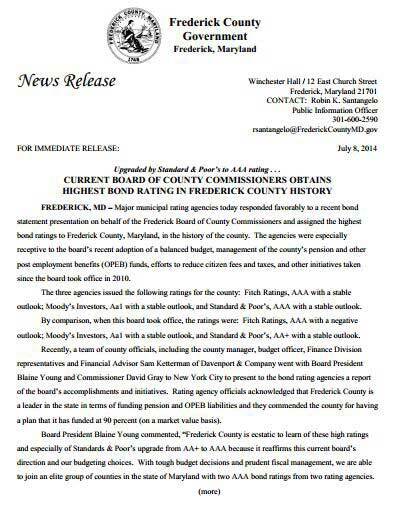 On July 8, 2014, Standard & Poors announced that it was increasing the Frederick County bond rating from AA+ to AAA stable—the highest bond rating that Frederick County has ever had. This report and these improvements refute Gardner’s claims that she was a better fiscal manager of the County’s finances; no Board has been better fiscal managers of the County than the Young Board. CONCLUSION: Jan Gardner’s claim that this Board has increased the size of the budget by $87 million is misleading at best. Only $35 million of the higher budget represents an increase. And $21 million of that increase is due to increased burdens and taxes from the State. This leaves only $14 million of other increases—and they are for increased funding for education and for fire & rescue services, attributable to the 5,000 new residents. The Young Board has stopped the exploding growth of the County budget that occurred during Ms. Gardner’s tenure on the Board; it has kept increased expenses to a minimum; and it has improved the County’s overall fiscal strength, as reflected in the improved bond rating. In spite of all of this, Jan Gardner says it was a mistake for the Young Board to sell Citizens/Montevue. Therefore her budget would be $2-4 million/year more to support those continuing operations. And Jan Gardner says that the Young Board should have fully funded the BOE request—increasing the budget yet another $17 million/year(xi). Ms. Gardner is talking out of both sides of her mouth—on the one hand criticizing the Young Board because its budget is too high, and then arguing that we should have increase our budget by $20 million/year. i. As is explained in further detail below, in order to make a true comparison, the amount of the Gardner Board’s last budget should be $488 million (including fire & rescue services and permitting review services). See footnotes ii and iii, below. ii. The Gardner Budget did not include the cost of Fire & Rescue services–$43 million for FY2015. County taxpayers paid for fire and rescue services in the Gardner budgets, but this was a separate tax. What the Young Board did was include the cost of fire and rescue services in the County’s general fund. This resulted in a $43 million increase in the FY2015 budget, such that the County tax was higher, but the separate Fire & Rescue tax was eliminated. This did not increase the amount of the total County budget; it merely reflects a change in the accounting method—whereby Fire & Rescue services are included in the County Budget rather than billed as a separate tax. There is no net change in the tax burden on individual taxpayers by this budgeting change. It is true that the Young Board increased the amount of taxes for some residents, so that all residents would pay their fair share for fire and rescue services. For those residents, this is a tax increase on them. But this change was necessary to make sure that all taxpayers pay their fair share for the fire and rescue services provided for them. Prior to this change, there were residents in some parts of the county who were not paying anything for fire and rescue services. Also, there were people in other parts of the county who were not paying their fair share of the cost for such services. Taxes were increased in certain areas to remedy this. This was the fiscally responsible thing to do. The Gardner Board failed to do this. The Gardner Board operated a flawed tax system of paying for fire and rescue services. Under the Gardner Board, every one of their budgets fell significantly short (approximately $8 – 10 million) of fully funding the fire and rescue services for the County. Consequently, each year the County would have to take monies from the Fund Balance to make up the deficit. This practice by the Gardner Board was not the best way to handle such services. The Young Board corrected this practice to make sure that Fire and Rescue services were adequately funded in the County budget. This is one of the reasons that the Bond Rating agencies upgraded the County’s bond rating. iii. The State transferred to the counties (or “shared with the counties,” as the State would say) the obligation for the counties to fund teachers’ pensions. The increased cost on Frederick County is approximately $8 million in the FY2015 budget. iv. The Young Board has had to deal with the loss of $10 million/year of Highway User Revenues (HURs) from the State in maintaining our roads. This does not cause a direct increase in the County budget, but indirectly it does. Very simply, the County has had to pick up the slack, by providing $10 million/year more to maintain our roads. v. Because the Maryland State Police reduced the number of officers serving in Frederick County, this has increased the law enforcement burden on our Sheriff’s Office. The County’s FY2015 budget includes $.65 million more for the Sheriff to help meet this need. The Sheriff requested three times this much to meet the increased burden that has been put on his office. But the BOCC was not able to fully fund his request at this time. vi. The State-mandated cost to Frederick County to do stormwater remediation has increased by $2.8 million more than it was in the last Gardner Board budget. vii. The County has increased its funding of the BOE by approximately $6 million/year more than was funded by the Gardner Board. This is in addition to the $8 million/year more that the County now pays for teachers’ pensions, as explained in Footnote iii, above. vii. The Young Board’s FY2015 budget funds Fire & Rescue services at $8.6 million/year more than the amount of funding by the Gardner Board. It should be pointed out that the Gardner Board increased the funding of fire and rescue services by $19 million over its four years. ix. The FY2015 budget includes $6.2 million which are one-time budget transfers, and which are not increased tax burdens. These include a $4.4 million transfer in connection with the transfer of operations of the Citizens/Montevue facility, and a $1.8 million amount which is due to a delay in the sale of the 520 North Market Street property. x. The number of employees in January 2011 was 2353; the number of employees on 6/23/14 was 1902.
xi. Actually, Ms. Gardner did not specifically state that the budget should be increased to fully fund the BOE request. She said on the radio, just prior to the May 6th budget hearing, that she thought the County’s needs could be met without raising taxes. However, if that is the case, then Ms. Gardner should have indicated what parts of the proposed budget that she would cut in order to come up with the extra $17 million requested by the BOE. She declined to do this.